It’s a pleasure to talk about a new book, one that has just been launched. 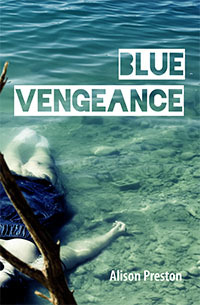 Blue Vengeance, Alison Preston’s seventh novel, takes us once again to Norwood, the Winnipeg suburb where she grew up and where she still lives. This time, the action takes place in 1964 and centres on 13 year old Danny Blue, who embarks on a quest to make the person responsible for his sister Cookie’s death pay for the crime. Preston’s take on Norwood is deadpan funny and more than slightly askew. But her characters struggle with devastating issues, making choices that are often messy and morally fraught. Though her books have mysterious elements, they are much less conventional than the “mystery” label would suggest and have an elusive quality that is intriguing. And read on as Alison participates in an e-interview with me. CM: What is it about 1964 that made you want to set the book in that time? AP: When I realized the book was going to be about young teenagers, I knew I had to set it in the past. I didn’t want the action and interaction to be built around hand-held electronic devices. And then when I realized the exact age of the characters (Danny thirteen turning fourteen, and Janine fifteen turning sixteen), 1964 muscled its way in. That was the year that I turned 15, and it is vivid in my memory, partly because of the Beatles turning up on Ed Sullivan, partly because that was the year of my first real boyfriend – the one with whom the kisses really counted – and the serious heart-break that went along with that. CM: How did you get into the head of a 13 year old boy from 1964? Was it totally an act of imagination? Or did you do research? AP: I think it was an osmosis kind of thing. I have a brother; I’ve always had a brother. I played with him, hung around with him, followed him, pestered him. I insinuated myself into his friendships. And I always had friends who were boys. And remained so. I think deep down we’re all still young teenagers. I researched practicalities with my brother, like with slingshot usage. He was flabbergasted by my ignorance. So I incorporated that into the book with Paul’s amazement at Danny’s stupidity (not knowing he couldn’t hit moving objects) and his disgust with the feebleness of Danny’s shooting at leaves. And with another slingshot–related revelation that comes towards the end of the book. I won’t divulge that one. CM: One of the pleasures of Blue Vengeance is that some characters from your other books make strategic appearances. The noble Frank Foote, your usual hero, is the person who finds Cookie Blue’s drowned body. And Morven Rankin from The Girl in the Wall provides information at a key moment, like a 1964 Delphic oracle. Do you get as much pleasure from the walk-ons of these characters as your readers? AP: I do, indeed, get pleasure from placing characters from other books in a new novel. And thank you for saying that there’s a possibility that readers may enjoy this too. I was worried that no one would like Morven Rankin (from “The Girl in the Wall”). When a friend mentioned that she liked her a lot and hoped I would put her in another book I was ecstatic. At first Morv just had a tiny role in “Blue Vengeance”: the scene in which Danny and Janine walked past her and her brother George, and neither she nor Janine said hello. But then I enlarged her presence with the unpleasant scene in the gymnasium and then further to the Delphic oracle. I loved doing that. CM: You often write about children grappling with very grown-up problems on their own. And these children are very astute observers of adult foibles. What attracts you about the world of childhood? AP: I identify with children grappling with grown-up problems on their own. At the risk of sounding like I had a horrible childhood (which I didn’t), I was often left on my own to grapple with grown-up problems. Childhood in 1964 looks relatively golden to me. I loved spending the time it took to write “Blue Vengeance” in that golden place.